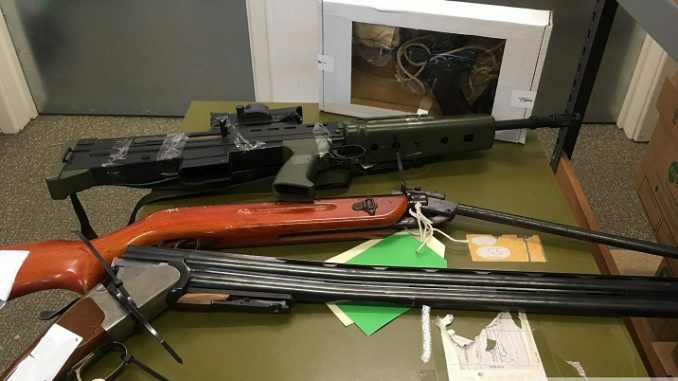 Shotguns, pistols, air weapons and ammunition have been handed in during the first week of the Kent Police annual firearms surrender. The amnesty – which began on Monday, January and ends on Friday 1 February – allows the public to dispose of any unwanted or illegally-held guns and ammunition. Others are from criminal networks. Any firearm believed to be linked to criminal offences will be investigated in the usual manner. The latest figures reveal 77 firearms have been handed in so far which includes 30 live-firing firearms made up of 25 shotguns, four revolvers and one pistol. Officers have also been handed 20 air weapons and approximately 1,140 rounds of live ammunition. Detective Chief Inspector Patrick Holmes said: “So far we’ve had an excellent response to this surrender and I’d like to thank the public for helping to remove a number of firearms from the streets. “Every firearm off the streets is another weapon which has been prevented from being potentially used in criminal activity. Please continue to take full advantage of this surrender and hand over any unwanted or unlicensed firearms. “Anyone who has an unlicensed firearm in their possession, or knows where one is being kept, now has the chance to hand it over or tell us anonymously where it is being kept. Knives too please… more people getting stabbed than shot!